Global Authentication Holdings, the parent company of Global Authentication Inc., filed for Chapter 11 bankruptcy last month in a U.S. Bankruptcy court. The filing lets the Tustin, Calif.-based card grading and memorabilia authentication company reorganize and also could result in a discharge of debts. The company’s assets are listed between $50,000 and $100,000, while its creditors are owed somewhere between $1 million and $10 million. Among its top creditors are the Internal Revenue Service, Global employees Steven Rocchi, Mike Baker and Steve Sipe, as well as several memorabilia dealers and other companies. GAI will continue to grade and authenticate memorabilia during the filing, while a meeting of creditors has been scheduled for Jan. 28. Last May, Ault Glazer & Co. Inc. announced that it had finalized the complete purchase of Global after investing and lending to the company for two years. Is this Woman's Collection Better Than Yours?! 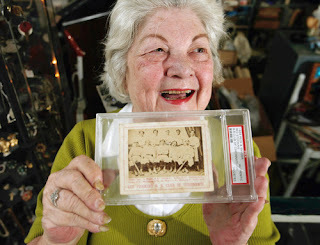 FRESNO, Calif. – Somewhere amid her collection of worn jukeboxes and slot machines, a 72-year-old California woman recently discovered an antique worth saving: a rare baseball card of the first professional team in the United States. And if it weren't for the keen intervention of a friend, she would have sold the 1869 card of the Cincinnati Red Stockings on eBay for just $10. "I didn't even know baseball existed that far back," said Bernice Gallego, who owns an antique shop in Fresno, a mid-sized city in the state's farming region. "I don't think that I've ever been to a baseball game." She put a $10 price tag on it, deciding against $15 because it would have cost her an extra 20 cents. She pulled it from auction after realizing it could be worth much more when someone asked her to end the auction immediately. The front of the card features a sepia-toned, gelatin-silver photographic print of the entire team. The reverse, a red-and-white advertisement for Peck & Snyder, a New York sports equipment manufacturer. Experts at the Los Angeles-based PSA, the leading sports card grading and authenticating company, say the card is authentic and the team photo is relatively unscathed. Sports card collectors prize any card featuring the Cincinnati Red Stockings, who laid the foundation for today's Major League Baseball. "They were kind of an All-Star team before that concept really existed," said Tim Wiles, who directs research at the Baseball Hall of Fame in Cooperstown, N.Y. "They went around and challenged all comers. They barnstormed around the country and were undefeated." Gallego and her husband still can't say for certain how they got the card, but believe it was in the contents of a storage space they bought a few years ago. "We really don't know where we got it," Gallego said. "It's a little card I found in a bunch of stuff."